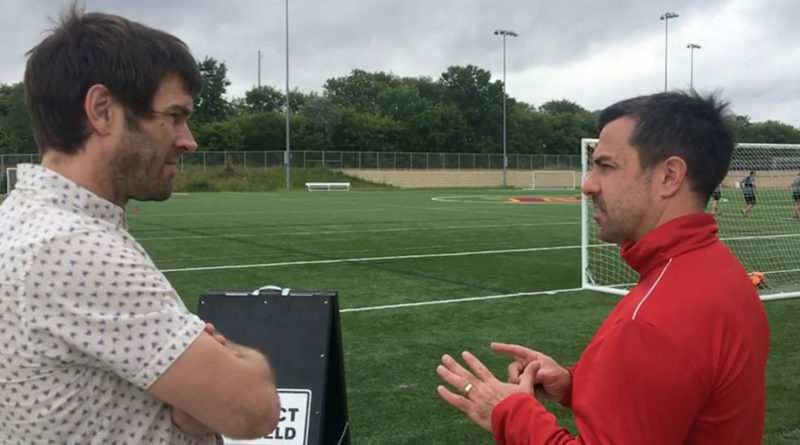 Matt Lawrence, a former professional soccer player in England who now works as a color analyst for Sporting Kansas City and NYCFC Radio, was invited to a recent PRO training camp to experience the development and training work that PRO regularly executes. Lawrence enjoyed successful playing spells with Fulham and Crystal Palance, as well as spending the majority of his playing career with Millwall, who he captained in the 2004 FA Cup Final. Having made nearly 600 career appearances he has spent plenty of time in the company of referees, but visiting PRO’s camp gave him a different perspective on their work and the dedication required to make it to an elite level in North America. What were you expecting when you came into camp? I had a few pre-conceived ideas, but I didn’t expect everybody to be as friendly and as personable as they are. Referees I’ve dealt with, and that you see on television, you expect them to act like policemen or school principals, but they were all very gracious. The biggest thing for me was that everyone was willing to learn, and that’s important in any walk of life. Nobody knows everything, and we all want to learn more and garner experience, and these bi-monthly camps that PRO have are fantastic for that because they also help to create a team spirit. Were you watching from afar or getting involved? It’s been a real eye-opener because I’m sat there as a player with more than 15 years’ experience playing the game, joined by 12 or more current referees and Howard Webb, a World Cup Final and Champions League Final referee, and sometimes we still didn’t come to a decision we all agreed on – that shows how subjective soccer is. We’d sit and discuss offside calls, whether the ball is in or out of play, different fouls and sometimes you can never find the perfect still image or camera angle that shows you 100 percent what you need to make the correct decision. I’m always looking to learn and gain experience, and getting involved in camp exercises really proved what a tough job referees have because they know the laws inside out, but it’s about interpretation, and that changes between officials all over the world. There are always going to be arguments from both sides. Has it changed how you will approach your next piece of commentary or analysis? I used to picture referees as these automated, robotic guardians of the law, not as human beings which of course they are. Visiting PRO’s camp has broadened my horizons and widened my exposure hugely. That doesn’t mean I’m going to go easy on a referee because if they clearly get a decision wrong, then they’ve got it wrong, but I’m now aware of just how many decisions are subjective because there are a lot of gray areas in soccer, no matter how many times you watch them back. It’s been a great few days that will only widen my experience with referees and help both my media career and watching of soccer as a fan. You realize how very difficult it is when the game is at full speed – when you watch it in slow motion some things look worse, some better – maybe an arm seems more outstretched than it did before. It has made me more appreciative of the job they do here in MLS and around the world. You’ve experienced referees in the UK as a player and now here in the US as a broadcaster, are there any notable differences? I was speaking to Howard [Webb] about his career path, and he spent 15 years or so making it to the top, and the average in the UK is about 20 years. Referees get to the top a lot quicker here, and I don’t mean that disparagingly, it’s just because there isn’t a massive soccer infrastructure yet. You need a lot of experience refereeing; you’ll be better in your 500th game than in your fifth, that’s just a fact. It’s also a different game here – MLS is arguably harder to referee because there are so many changes in possession, some challenges that fly in perhaps aren’t as skilled and then questions get asked of the referee. That will get easier as everyone in the game becomes more experienced. Not only are the referees developing here, but PRO is evolving and MLS is growing rapidly too. At 44 I’m too old now, it wouldn’t be a good time to start, but if I had suffered a bad injury early in my career and wasn’t the same coming back then it wouldn’t be a bad career move to make, but it’s still a very hard profession and the more people appreciate that, the easier referees’ jobs become. It’s easy to keep your head below the parapet and go to work on a keyboard, vilifying and castigating a referee, but if you believe it’s that easy to be an official then get off your keyboard and referee your kids’ U8 games, then you’ll see how difficult it is. That’s just in front of a few people, not 25,000 people in a stadium and two million watching on television.